If you are looking for something fun to do with your kids this weekend, then why not celebrate by turning into a pirate on Talk Like A Pirate Day celebrated on Saturday, September 19! Avast, tharrr be lots of swashbucklin' fun and games for all ye pirate lovers out there. 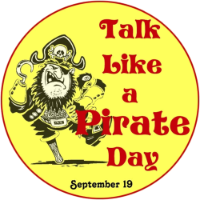 Talk Like a Pirate Day is officially Saturday September 19th, so get ready for the best day of the year! Arrr! As you sail your ships, wear your eye patches and pirate scarves and talk like a pirate (make sure to see the glossary below! ), don't go hungry! NOBODY likes a Hungry Pirate!! Let Pirate's Booty help you keep energized and talking like a Pirate on Saturday (and EVERYDAY!)! Their snacks are so tasty, free of artificial ingredients and so addictive!!! So check out this Glossary, so you are ready to Talk Like A Pirate! Are you a land lubber and wish you knew more pirate lingo? Aye, aye - “Yes, sir!" My children are practicing for Talk Like A Pirate Day! 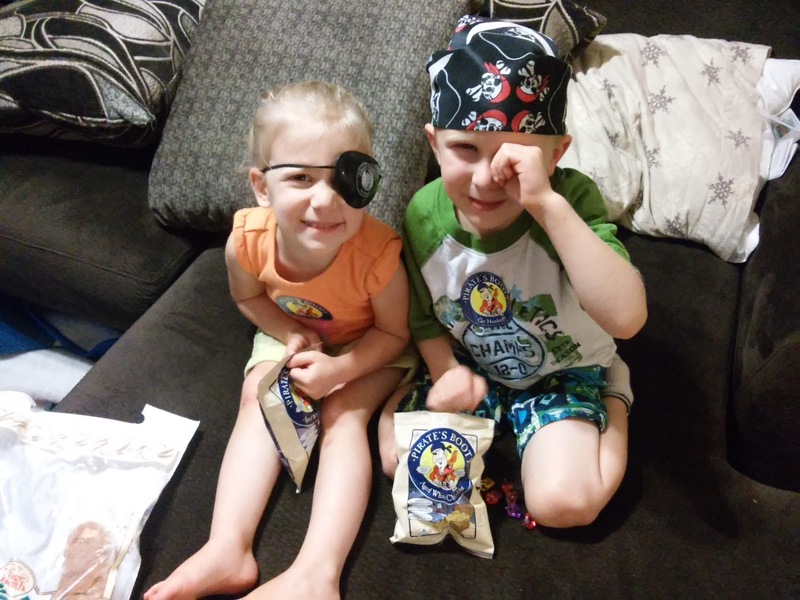 They love to dress up as pirates and they are practicing their Pirate talk while snacking on their Pirate's Booty! They can't wait for Saturday! It should be a fun day for all! Make sure to check out Pirate's Booty "Talk Like a Pirate" page for fun activities, fun sweepstakes and even a local tour near you! Pirate's Booty is generously offering TWO bags of 4oz Pirate's Booty to a lucky winner!